We have a wonderful range of pipes. From straight to bent we’ve got what you are looking for, take a look at some of our favourite pipes below. This pipe has a beautiful smooth finish and a bent stem. Featuring a metal filter system, reducing the tar and nicotine intake giving you a smoother and more satisfying smoke. 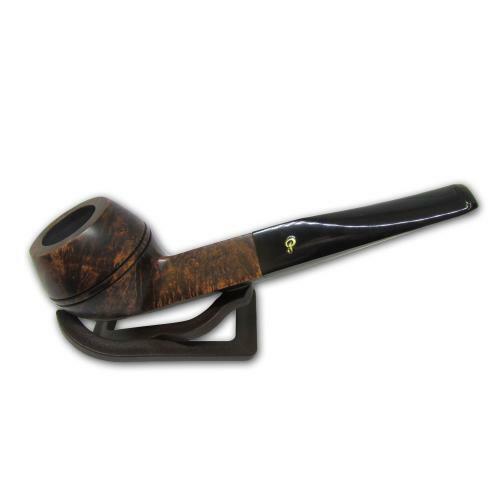 For the quality you are getting this pipe is reasonably priced at £59.99. It’s definitely a good start up pipe perfect for any novice or and everyday pipe for the more experienced pipe smoker. The stem on this pipe is beautiful, white with hints of gold really making this an extremly attrctive pipe. The Peterson Atlantic Series range of pipes were introduced to the pipe market in early 2015. Another bold and exciting range from Peterson, as they try to shake up the world of pipe smoking. Beautiful deep and rich blue stain on the bowl shapes with a gorgeous olive green marbled mouthpiece. The polished Nickel band is inscribed ‘Atlantic’ and gives the pipe a nice finish. The fishtail mouthpiece has the exit hole in the end of the mouthpiece for a comfortable smoking experience.